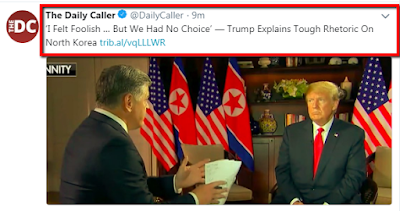 Further to my article of June 3 (and my many follow-up comments/updates), I'm left wondering what planet I'm living on after witnessing a get-together with President Trump and Chairman Kim in Singapore last night. 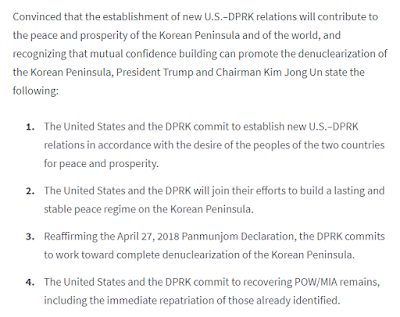 At the conclusion of their meeting they signed a rather sketchy Joint Statement, which can be read in full here (part of it is shown below). 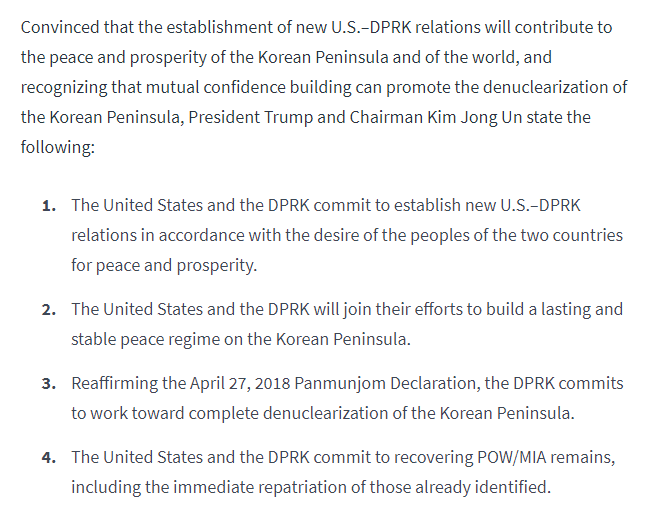 Apparently it's not even as strong as past statements signed by previous U.S. Presidents and NOKO leaders. We'll see where things develop in the future. During brief comments to the press in several breaks throughout the summit and at his subsequent press conference, Mr. Trump was full of flattering remarks about Mr. Kim, while in the same breath, he continued to disparage his allies, especially PM Trudeau...his 'punching bag du jour.' He shouldn't be surprised that America's trading partners would retaliate with their own tariffs in response to his...he knows full well that they have their own countries' interests to protect and will do so, regardless of his personal opinions about them. I got a kick out of this analysis of his post-summit remarks by CNN. World-wide responses to the summit and agreement are mixed. 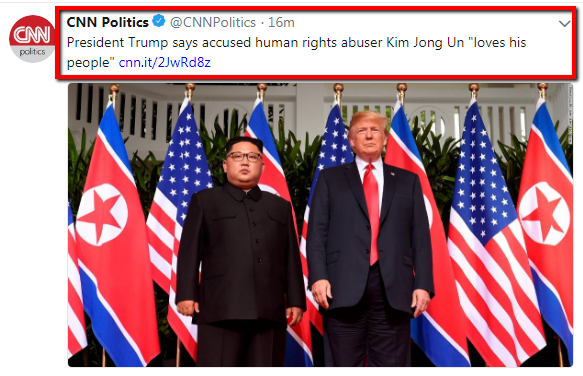 (whose parents are suing NOKO for torturing and murdering their son)! President Trump ends military drills with South Korea, calling them "provocative war games"...a description normally used in propaganda by your opponents. 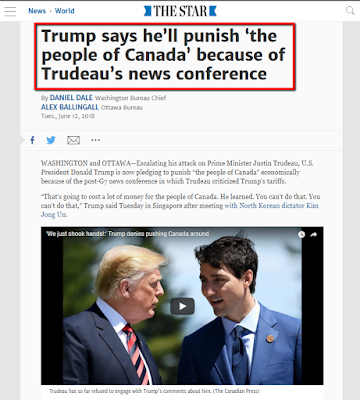 Seriously?...He continued with his erratic and odd behaviour as he delivered threats to punish Canadians for PM Trudeau's retaliatory tariffs through snarling teeth and with scolding finger-wagging gestures...this came only hours after publicly scoring his relationship with Trudeau as a 'ten' in his press conference that immediately followed the G7 summit. So far, Mr. Trudeau has taken the high road and has refrained from engaging in such pejorative attacks, with the full backing of Canadians...I wonder if Mr. Trump has the full backing of Americans. And, does this now mean that he will 'feel foolish' again if he's compelled to use tough rhetoric in the future on Kim...or, now that he's exposed this character weakness for Kim and the world to witness, will he continue with his over-the-top flattery of him no matter what? Who can now take him seriously when he lashes out and uses harsh language with anyone? 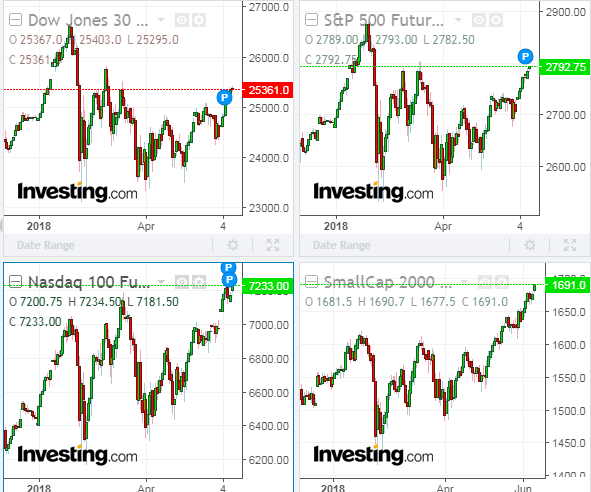 Meanwhile, U.S. futures markets were muted overnight in their reaction to this news and are slightly up as of 12:00 noon ET today. 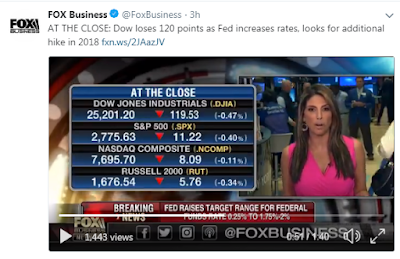 If President Trump continues with his steel and aluminum tariffs, and implements additional ones as he's already threatened to do, we'll see how a world-wide trade war impacts inflation and how quickly Central Bankers then raise interest rates (or dispatch further monetary QE measures) to combat that effect. That may have more effect on markets than future talks with NOKO. So, will common sense prevail when it comes to President Trump, allies, and trade wars? Do actual (correct and proportional) facts matter to Mr. Trump? 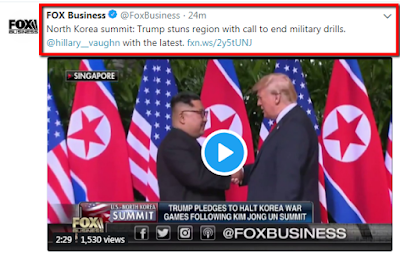 We'll see...for the time being he's cozying up to NOKO, China (ZTE) and Russia (inviting them back to rejoin the G7, which was NOT supported by G6 leaders). 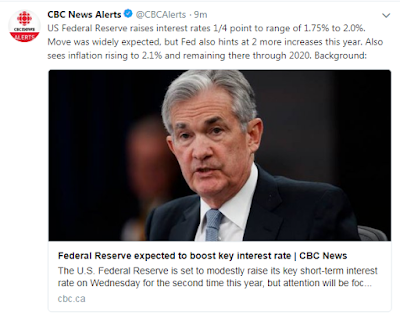 A slightly more hawkish tone was present in today's FOMC press release regarding future U.S. interest rate increases, including two more for this year...(click here for Fed meeting calendars, statements and minutes). Of note in Chairman Powell's press conference was his announcement that he will hold a press briefing after every Fed meeting beginning in January of next year.